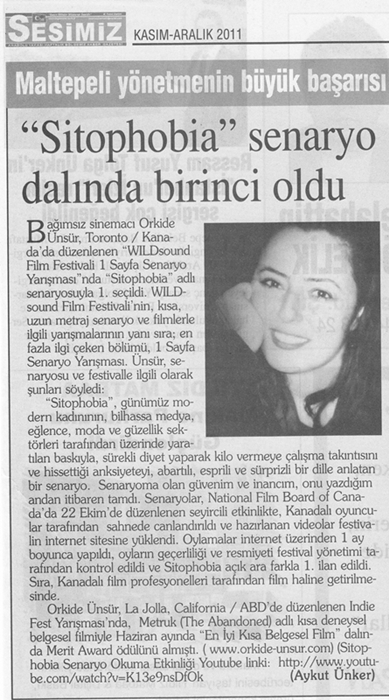 I’m thrilled by the congratulation letter sent by Culture and Tourism Ministry Cinema General Director Mr. M. Cem Erkul for my screenplay Sitophobia which won the Wildsound One Page Screenplay Contest in Toronto, Ontario / Canada in December 2012. I would like to send my deepest gratitude with my kindest regards to Mr. General Director for his kindness which has been a great motivation for my new projects. “Sitophobia” wins the WILDsound One Page Screenplay Contest! I’m proud to announce that my screenplay “Sitophobia” is the winner of the WILDsound FALL/WINTER 2011, 1 page Screenplay Contest at the WILDsound Film Festival in Toronto, Ontario / Canada. It will be made into a film by Canadian filmmakers in 2012. Fashion, diet, health, welness, as well as media and entertainment markets have been constantly pushing today’s modern women for being more slim and more skinny. Sitophobia draws attention to this important subject and it exaggeratedly, humourusly and surprisingly tells about the anxiety of a slightly overweighted young woman. I have a total confidence about Sitophobia and I am sure the audience will like its strong cinematographic side when it is screened. I would like to congrats all the script writers since it is already a challenge writing one page script. It was an exciting and enjoyable journey… A special thank you for all voters and supporters. Many thanks to WILDsound organization and especially to Mr.Matthew Toffolo for giving me this opportunity. My one page screenplay SITOPHOBIA is finalist for WILDsound FALL/WINTER 2011, 1 page Screenplay Contest at the WILDsound Film Festival in Toronto, Ontario / Canada. SITOPHOBIA will be read at WILDsound’s Saturday October 22nd festival event. The actors in Toronto will perform the script on-stage and the video clip will be placed on the WILDsound site. Then there will be a vote online where people will pick the winner, which will be made into a film. You may read the screenplay as pdf format below. I’m proudly announcing my one page screenplay SITOPHOBIA is selected as finalist for WILDsound FALL/WINTER 2011 1 page Screenplay Contest. 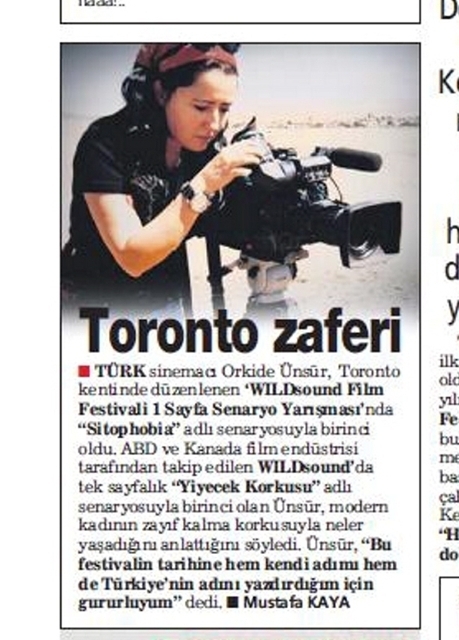 WILDsound Film Festival is Toronto, Ontario / Canada based film festival which has different categories. SITOPHOBIA will be read at WILDsound's Saturday October 22nd festival event. Then there will be a vote online where people will pick the winner, which will be made into a film. I must say, writing a one page screenplay is an exciting and enjoyable experince as well as great challenge it is.